Get set with our pro performance hairsprays. Whether you want to fully secure your look, or to help take control of your frizz for 24 hours, TRESemmé has a range of hairsprays to meet the level of hold you need. To freeze your look in a flash, why not try a TRESemmé hard hold hairspray with level 5 hold to ensure your updos will not fall flat with this hardworking product. For a lighter all-day touchable hold try a level 3, allowing your locks to move naturally whilst giving you the control and grip you need to help tame frizz and flyaways. All TRESemmé hairsprays are non-sticky to the touch and brush out easily. To apply TRESemmé Hairspray, spray from 10-12 inches away from your dry hair, one section at a time. For a stronger hold, layer more coats just where you want more control. For maximum fullness, flip your hair upside down and mist all over to set. 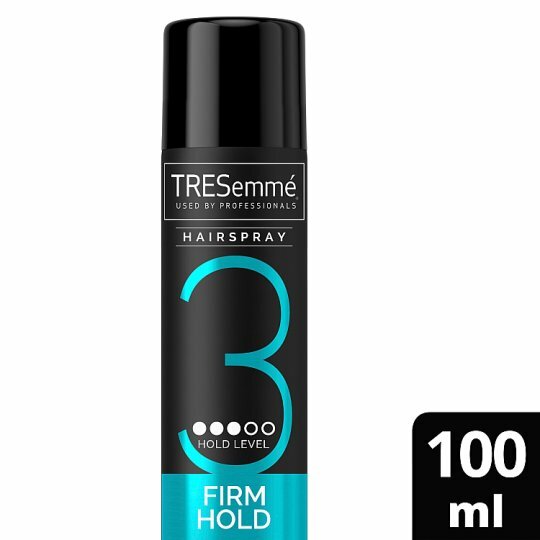 If you think TRESemmé Firm Hold Hairspray is one of the best hairsprays, don’t keep it a secret. Leave a review and share your tips.